Well, I am back from my 2 weeks Christmas Holiday in Ireland. So much happened that I find it difficult to process everything, or unpack it as the Americans might say. We had such a great time and met so many people that it really did turn into a holiday of a lifetime. I am so grateful to my brother Antoin and his wife Cathy for all they did for us as I am to all my friends who invited us into their homes and made time for us. We had such an action-packed two weeks and although we never saw the sky for longer than a half hour due to the clouds, we did not want it to end. 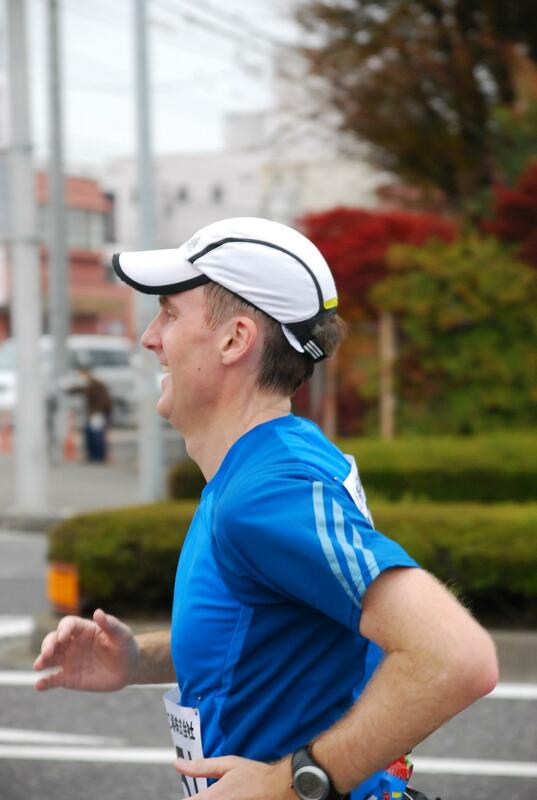 Now I am back in Japan and just 9 weeks out from the Koga Hanamomo Marathon. I managed to keep running in Ireland, but not very consistently. I also managed to put on a couple of unwanted kilos but that is part and parcel of a good holiday so I cannot complain. Now I have to do something about it, and I know just want to do. Stop drinking alcohol, stop eating pastries and run every day. Easy! As you can see in the graph below, my HRV increased nicely up to the Ohtawara Marathon on the 23rd Nov and only really took a dive around the time I got sick on the 10th November. I did not take my HRV regularly over Christmas but I am back taking it every day now and hopefully, we will see it creep up again as my fitness increases and I prepare for my race. The only thing that concerns me is that I have another trip to Europe from next week and jet lag always plays havoc with my HRV. I should be able to get up and run in the morning as I normally wake at 4am when I go from Japan to Europe. Staying awake past 8pm will be the problem. On New Years Eve morning I got up early and headed down to the Cork Marina for my last run there. I love this part of the city. It is less than 4km from my brother’s house so it is easy to get down, do a run and get a coffee before getting back. More people were out running than the previous week and I enjoyed the sunless dawn looking out over the waterless harbour. The rest of the day was spent wandering around Cork getting ready for the evening. And of course, there were pints and vegan pizza as well. New Years Day was our last day in Cork. After lunch, we headed up to Dublin for our flight back to Japan on Wednesday. My Heart Rate was elevated and my HRV was suppressed. This was a result of a good night celebrating the New Year with our families. Antoin and I did manage to get out for a quick run around his neighbourhood before he drove us to Dublin. It is always good to get in a run on the first day of the year, even if it is not as long as you might have liked. Normally I do this run in Nagano, but I was just as happy to do in Cork this year. We arrived back in Japan at 10am on Thursday morning and were home by 13:30. There was plenty of time to run but I was wrecked and could only go to bed. Friday was not much better. On Saturday I forced myself out of bed to join the Namban Rengo Hill Repeats. My RHR and HRV were still not in a good place but I knew that I needed to make a start. I did a lap of the palace with Chika san before the Hills started and while I did feel rather heavy, my pace was not too bad. The Hills went better than expected. I don’t have a set distance to run. I just time myself for one minute and see how far I can go. I feel that I was able to run further than I had been before Christmas. Maybe it was the rest. Maybe it was the shorter run that I did before the Hills. Anyway, I will take it. It was also great catching up with all my old friends for the New Year. As well as meeting people I had known for almost 10 years, I met some new folks as well. Mark has been part of our Run Streak group since last October. Although he is a long-term Tokyo resident I had never had the pleasure of meeting him before. And I spotted Jun wearing a No Meat Athlete T-Shirt. This is a Podcast that I listen to and really enjoy. I just had to get a photo with him as well. On Friday morning, Faith from Namban Rengo sent out a message that she would be running along the Tamagawa from 7am with her friend from Sydney on Sunday and was looking for people to join. I had to say yes. I knew that it would be a challenge with the jet lag, but I also knew that it would most likely get me out the door for a much needed long run. I had been awake for most of the night when my alarm sounded at 5:55am but my RHR and HRV were back where they should be. A big group of 8 showed up at 7am and we headed off into the bitterly cold morning. Faith’s runs are always good as there is no messing about. After a short warm-up, she hits the target pace and then holds to it. I probably went out a bit too fast. I was happy with the first half as I able to push myself and run a bit faster than I had recently. My thinking was that my next race is the Ohme 30km on the 17th Feb and I need to be able to run at a hard pace for that full distance. Today’s effort shows that I still have a bit of work to do. I was also pleased that I could keep running without stopping for a drink until the 17th km but after that, the wheels came off and I struggled to get home. Still, it was a great day and I enjoyed the run. This week turned out well for running although I was doing a fair bit of travelling. I headed to Hong Kong on Sunday and then moved on to Singapore on Tuesday. On Thursday evening I was on the way back to Tokyo again via Hong Kong. It was a terrible flight and I arrived in Tokyo feeling awful at 5am on Friday morning. Fortunately, I was able to take Friday off work and catch up on some sleep but I was still battling sleeplessness for the next 2 days and my HRV and RHR took a beating. It gradually started to return to a normal number on Sunday morning and I was able to feel better. I just need to get to bed early tonight to continue the process. I am 71 days into my running streak and I don’t want to mess things up. I woke early in HK and headed straight out to Victoria Park for a quick run. It was not as busy as the night before and I enjoyed a good run. Then it was off to work to meet the team and enjoy some good veggie food. I left Hong Kong around lunchtime on Tuesday and headed to Singapore. My first stop was to meet James, a former colleague. We chatted for a while about old times and then it was good to catch up. I then took a taxi to the hotel and checked in and headed back out to do my run. I was enjoying running down the East Coast Park so much that I could not stop and I ended up doing 20km. I was actually feeling quite sore by the end. I put this down to the old shoes that I was wearing. I always bring old shoes on a business trip as I don’t mind throwing them away. On Wednesday it was straight into work. We wrapped up about 8pm at night and I took a short rest before heading out again and getting my run done. It was only a short run but as my HRV was getting worse by the day I did not want to do too much. Thursday saw a good increase in my HRV and I was out on the street again at 6am for the final run of my trip. I discovered a new route that I had not run before. It is called Gardens by The Bay East. It looks newly made and there is lots of space for running and cycling and great views. After catching up on some work in the hotel, I then headed to the office for a couple of more meetings before heading to the airport for the flight from hell. Singapore to Hong Kong was fine, but the follow up flight to Tokyo was terrible. The space between the seats was too small and I could not get any sleep at all. I arrived in Tokyo at 5am and got home around 6:30am. I did not take my HRV but I know that it was really bad and headed straight to bed. I slept until about noon and then got up to do some work before heading out for a short run along my Tamagawa. It was a relief after running in Hong Kong and Singapore where my average heart rate was in the 150s. Now it was barely 140. I went to the team year-end party that evening and felt very sleepy throughout. It was a great event and I am glad that I got back to Tokyo in time to attend. I had hoped to be up in time to go to the Hill Repeats on Saturday but I was just too tired and slept in until 9:30am. After breakfast, I headed off to a Bikram Yoga class. As I will be going to Ireland in a week, I will not have time to go much this month so I am trying to get in a few classes on the weekend. After the yoga, I headed up to the palace for 3 laps. It was a good run but the place was crowded and I had to slow down to walking speed some of the time. The run went well and I enjoyed the late afternoon sun before heading off for a falafel and a drink with Bob and Naoko. I was still tired on Sunday morning but my HRV was headed back in the right direction. I slept in again and then headed back to Bikram Yoga for another class. I felt slightly better than Saturday. Sometimes the second class is good even though you are feeling sore. I then went home for a nice easy 10km along the Tamagawa river again to wrap up the 7 days of running this week and 80km. I like routine. For 7 years I have basically done the same race, stayed in the same hotel and ate my pre-race meal in the same restaurant. I have not always gotten the same results, but the routine takes a lot of the thought and anxiety from a race. A bit like Steve Jobs and Mark Zuckerberg wearing the same clothes every day, just not as weird. The hotel was fine but it is always hard to sleep before a race and I woke with a slightly depressed HRV. I was not too worried as it is normal for me to feel a bit anxious on the morning of a race. We left the hotel at 8:30am and drove over to the start point to met up with the rest of the Namban Rengo team who were running. One of the great things about this race is the proximity of the changing hall to the start line. You can literally leave the warm building at 9:55 and still be in time for the 10am start. Nick was looking great for a man who had half a night’s sleep. He has really excelled at running in the last 2 years and today was to be no different. We are the same age but he seems to be getting better and better with age while I am clearly holding back the years. I had gotten the good news the night before that Terri would be starting in B Block while I would be in C. This is good news because Terri always passes me and knowing that he is already ahead of me at the start means one more thing that I did not have to worry about. Nick was also in B Block after his great run last year, but he chose to start with Rie and myself in C as the 3:30 pacers were there. The pacers were a man and a woman with an orange and pink balloon attached to their caps respectively. They were in great form and announced at the start that they would run 3:30 gross, not net, and that would mean averaging 4:59 per km. They also said that the first km would be rather slow as we made our way out of the stadium and that we would need to make that up in the first half before the race started to go uphill. Ohtawara Marathon is a V Course. You start, you run downhill, you run uphill and then you finish. Nick and myself started together, just behind the pacers, and Rie was a little to our right. I was not to see her again until 23.5km into the race. The pacers were right about the first 1km. We covered it in 5:44 and then spent the next 8km making back the time that we had lost. The starting temperature was 8 degrees with a 5 m/sec wind. In previous years I would have just worn a singlet in such conditions as it was very sunny. This year I was much more wary of the wind in the second half of the race where you are running through a very exposed section and decided to wear an undershirt. I immediately regretted my decision. Not long after the start, I was sweating buckets as we ran downhill with the wind at our backs. I started rolling up my sleeves and contemplated Paddy’s advice to remove the undershirt at some point and tie it around my waist if it got too hot. I knew if I stopped now I would never catch up with the pacers again and just drank at every opportunity to compensate for the extra sweat. Nick was flying. He was not even trying to stay behind the pacers. He was running up beside them to the right and in front of them from time to time. He was like a horse chomping at the bit with the jockey holding him back until the right moment. At one point I felt that I was becoming too far adrift and ran on the outside until I caught up with Nick and the pacers again. A few minutes later I was back where I started. At around 13km we swung to the right and down a nice hill before going back up for a while. I remembered this place well because it was at the 15km point that the 3:30 pacers had passed me last year and I could not go with them. I had started too fast with Nick and Bob J at a 4:45 /km pace that I could not sustain and I was already fighting my War Of Attrition at 15km when the pacers and their group, including Rie, came past. This year I had started more conservatively. Focusing on the orange and pink balloons, drinking at every chance I had and trying not to get dropped. Getting through the 15km point with the pacers was a big step up on last year for me and I continued to keep them in my sights for the next 8km. However, my left hamstring was starting to get sore. I first noticed it at 7km and by 15km there was no denying it. I tried to put it out of my mind and sponging it and covering it with water at every opportunity. The key point in the race is at 23.8km. The road swings around to the left and you begin the ascent. You also start to run into the wind every year without fail. I guess that that is what they call a prevailing wind. Just before we reached that point, Rie came past me as cool as you like. I had not seen her for the whole race and it was like she had just changed gears and was moving in for the kill. It was then I caught sight of the pacers and Nick. They had just turned the corner and I could gauge how far ahead of me they were. That was the last I saw of them. At first, the change in gradient is gradual but by the 24km mark, you know you are climbing. I put my head down and just counted off the kilometres. Just after the 26km point you are exposed. Running among paddy fields with no shelter. I was glad that I had my long sleeved shirt. Unlike 3 years ago, I had nobody to hide behind. I just kept going and passed as many people as I could. My pace was gradually dropping – 5:09, 5:18, 5:22, 5:32, 5:37, 5:41. The War Of Attrition had started in earnest. There were 2 crucial corners to turn to move away from the headwind. One at 30km and again at 32km. I made it through them and headed for the 35km point where the road drops for a bit and gives us some respite. At the 36km point, I knew I was spent and needed a rest so I start my walk/run approach. This involves running to kilometre marker, walking for 60 seconds and then running to the next marker. I did this 5 times keeping my pace around 6:00 /km as I crawled my way to the finish. Just before the 41km point, the Namben Rengo folks who had run the 10km were out in force cheering us on and Chiba san took this photo of me. It was great to see these friendly faces at this point in the race. I turned the corner and made the last effort for home. The final 400m around the track was tough but soon it was over and I was meeting my friends, drinking coffee and heading off to an onsen. For some bizarre reason, I love this race and this corner of Japan and I have come back each year since 2012. There have been highs and there have been lows, but it has always been interesting and always been fun. I hope that I can come back for many years to come and that many more people from Namban Rengo will experience the Ohtawara Marathon. This was my best marathon since Tokyo in February 2017 and I feel that I have started to turn a corner myself as well. I need to continue the focus that I have gained from the Get The Run Done group, which involves running every day and not lose sight of my final goal. At present, I am at 56 days and counting.